I am a strong believer in read alouds. I love how your brain paints the picture of the words on the pages. The only problem is I'm always the one doing the reading, so it is not that relaxing for me. Having someone else do that work for me is just wonderful. Heirloom Audio Productions has produced another amazing audio experience for our ears! Actually this one was quite interesting. It seems we don't have as many CD players as I thought in my house anymore. We first tried it on the PS4, then the Xbox - neither worked. I knew I had two computers with cd-roms and my DVD player but we wanted to sit in the living room on the couches - to be comfy. So my bright boy brought out the old karaoke machine and guess what - it worked!! So we gathered around the karaoke machine, which ended up being an awesome cd player (great speakers on that little thing!) The bigger boys (12, 14) were the ones to listen with me. My little guy played with legos on the floor but at 4, he really didn't know what was going on. Let me tell you a bit about this CD set! This isn't your typical straight - flat audio book. This is a full production. There is a narrator that tells the tale but each character is played by a different actor/actress. There are sound effects galore which really make you feel like your in the story. It really is an amazing little gem because it is more like an experience than just a audio book. 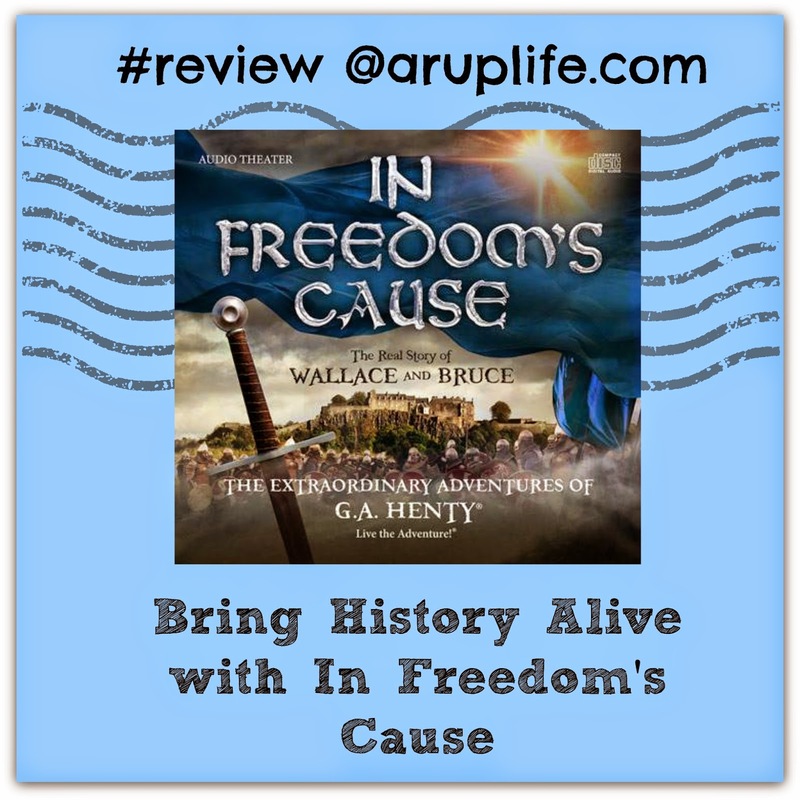 In Freedom's Cause is the story of Scotland in the time of William Wallace and Robert the Bruce. I've always found this to be fascinating. We meet Ned and Gerald (you might remember them from Under Drake's Flag) again. As they learn about this story, we share the experience with them. We studied William Wallace a few months ago in history so this was pretty awesome to go along with that lesson. My bigger boys remember what had happened and were able to tell me a bit of Robert the Bruce's story. Their is also a awesome study guide that comes with and goes along with the chapters. It contains comprehension questions and vocabulary words. By using this along with the audio you can make a whole unit study. We really loved this review. It was a nice change from our regular read-alouds. I loved how many of the characters believed in God and had extraordinary moral character. This is something we instill in our children and Iloved hearing it in this production. All the action was perfect for my bigger kids, they were thoroughly engrossed while listening. Even though the story of Scotland fighting for her freedom can be a sad one at times, G.A. Henty really tells a great tale and Heirloom Audio Productions brings it to life in the most wonderful way. It is an important lesson for all of us to remember that freedom doesn't come free. It is a worthy battle to fight - for freedom. Be sure to click on the image below to see what the other Crew Reviewers said about IndoctriNation!. You can also connect with them on Facebook and Twitter.